This project aims to use commercially smart glasses to make task-sharing/task-shifting a more efficient process by enhancing the clinical training process of medical officers and surgeons. A proof of concept has been completed by Dr. Oscar Obiga at Mulago Hospital using Pivothead’s wearables. It is envisioned that recording of videos could enable mentors/preceptors/faculty to more effectively coach their mentees; reviewing video footage should help a trainee improve skills and verify with the mentor if the trainee has mastered the essential steps to an operation. We believe using smart glasses ought to be integrated into a surgical mentorship platform, for example the task-sharing plan of DGNN to train 100+ medical officers and general surgeons in neurotrauma procedures. 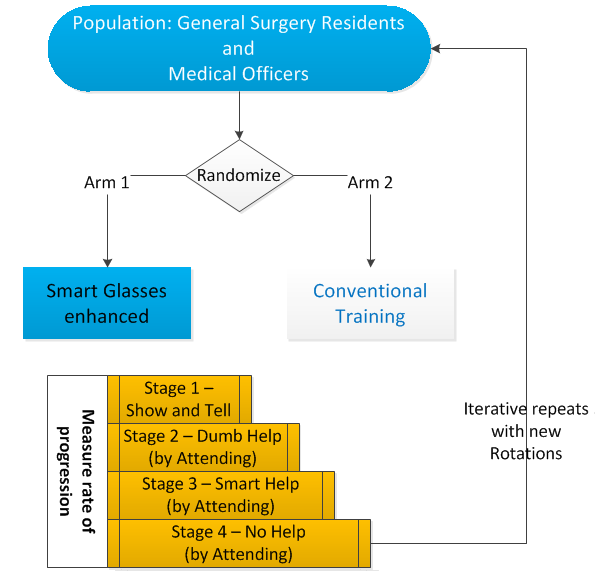 To generate the evidence, DGNN will launch one of the first studies of smart glasses in surgical training using a study design presented below. Trainees rotating through neurosurgery will be randomized to a conventional arm and a smart glasses arm. Progression, in terms of number of procedures and length of time, will be compared as trainees move through 4-stages proposed by Dr. Zwischenberger. We thank Duke Digital Initiative and USAID Higher Education Solutions Network for their support to date.